Energy Fitness trainer tells you why you should write down your Workouts..even on vacation! 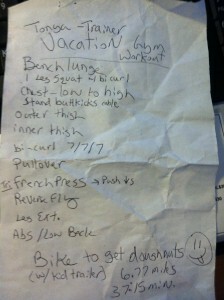 Home / Blog / Energy Fitness trainer tells you why you should write down your Workouts..even on vacation! I (Personal Trainer & Owner of Energy Fitness in Memphis) need accountability of having my fitness program/plan written down ahead of time. Even on vacations when I lift weights I ask staff/attendant for pen and paper because I know I will be more likely to forget exercises I need to do twice or just pick my favorite exercises if I don’t write it down in advance. At the bottom of this blog post I have included a pic of my last vacation workout session. I didn’t write down all the sets, reps and forgot to write down the mile I ran on treadmill to warm-up but you get the general idea. When at home you can be more detailed. You are more likely to do it ! This one is a biggie and the key to better results. write down the date: you may FEEL like you just did a set of exercises but if you are lifting weights 2 times per week (the average) and have 2 different programs you alternate between writing it down is proof it’s been a whole week since you completed that program. for cardio you can see exactly how much you are doing versus what you FEEL like you are doing (are you burning enough calories to lose 1 pound per week – 3500 calories. does your diet program support your weight loss or performance goal? you can see if your program has balance. Are you working too much chest and not enough back, or put another way too much pushing and not enough pulling? are you stretching the muscles being worked? If the above reasons are not enough and you need someone else to write down your workouts and keep you on track then hire a trainer (like Energy Fitness) to keep you accountable, motivated and on your way to being the best YOU! 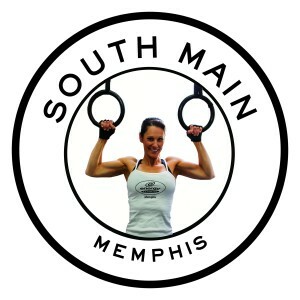 Not a client and want a Free Fitness or Nutrition Consult (value $87) or interested in our Personal Training Services click here or call us 901-466-6242.